The best payroll apps offer the convenience of managing payroll from an iOS or Android mobile device. The apps can be downloaded for free, and they allow users to perform tasks like running payroll, managing benefits, and electronically filing payroll taxes. We considered several payroll apps and chose the top six apps for small businesses. The best payroll apps make it easy for employers on the go to manage payroll when out of the office. When evaluating apps, our primary focus was on cost (service cost; the apps are free), ease of use, and depth of payroll processing features. Some apps may cost less money to use but won’t allow you to run payroll from your mobile device. Others require you to spend more money but have the 24-hour support your business needs. Cost: We considered the cost of the payroll service, including setup, monthly, and other costs. Ease of use: Some apps have demos you can use to test how intuitive the app is before buying the service. Support level varies: some are available 24/7 while others are open Monday through Friday. Phone, email, and live chat are possible contact methods. Standard features: The apps should have features that focus on automation and compliance; you can set some to run payroll and pay taxes automatically. Device compatibility: The best payroll apps work on the most common mobile devices, like iOS and Android; some may also work on Windows and Blackberry phones. Benefits: Beyond work hours and pay, insurance, 401(k), paid time off (PTO), sick time, and overtime are also important payroll components to manage. Advanced features: Some payroll apps offer more sophisticated payroll features, like time tracking and integrations, employee and employer portals, and payroll advisors you can speak with. We have selected Square Payroll as the best payroll app for small businesses. The Square app has easy setup, charges as low as $5 a month for adding a contractor, and handles all payroll tax payments and filings. Of the payroll apps that we reviewed, the Square Payroll app offers flexibility and convenience at the most affordable rate. Of the payroll apps we reviewed, Square Payroll is best for small businesses because it does the best job at offering a full range of payroll features at the lowest price. Setup is simple, and you can run an unlimited number of payrolls each month for no additional fee. Pricing for Square is relatively inexpensive compared to other payroll providers and largely depends on who you’re paying. For instance, if you only need to process payroll for independent contractors, you will pay a flat rate of $5 per contractor per month. If you need to pay employees, you will pay a monthly base fee of $29 in addition to the $5 per person you pay each month. If you decide to offer benefits, you may pay extra. For instance, there’s a $500 setup fee for retirement benefits and a monthly cost of $8 per employee. You can also add health, medical, dental, and vision insurance, as well as workers’ compensation benefits without paying any initiation costs. The monthly insurance premiums will vary according to the plans employees select, and your workers’ comp costs will vary by employee (depending on the nature of the job). With the Square Payroll app, not only can you process payroll and review your filed payroll tax forms from anywhere, you can also offer employee benefits through one of Square’s company partners. Employees can sign up for their own Square Online accounts and set up direct deposit and benefits. The app automatically syncs deductions and contributions each pay cycle, so you don’t have to manage the process. Square Payroll’s benefits feature helps differentiate it from other payroll apps by transforming it into a full payroll service platform and making it available to small businesses at such a low rate. By choosing our best payroll app, you can offer health, dental, and vision insurance plans through SimplyInsured. You can also add retirement benefits for a one-time setup fee and a monthly charge per employee. Square makes offering benefits to your employees easy; just click on the “How This Works” button for more detail or each individual benefit to get started. Square Payroll helps you save on payroll taxes by offering a pre-tax spending setup that removes employee commuter, dependent care, and health care expenses from employee taxable income. You can realize savings immediately because they are automatically applied to your next payroll. The Square Payroll app earns an A+ for automation. The system is designed in a way that allows you to accomplish more by doing less. Once you run payroll, which you can set to automatically process each pay cycle, payroll taxes are automatically deducted. The only experience you will have with payroll taxes will likely be reviewing the quarterly tax forms that are automatically filed. The employee setup process also makes your job easier. You will spend a couple of minutes entering an employee’s information, including email address, into the app, and Square will handle the rest. Your employees will receive an email with details on how to set up their Square Online accounts, and from there, they will enter everything necessary to automate payroll payment processing, deduction and contribution withholding, and preparation of year-end reports. Click “Add Team Member” to start adding employees and inviting them to create their personal online accounts. You can easily import employee work hours by having employees clock in and out of your Square POS app at no cost (or the Square Team app if you’re not using the POS app). This will eliminate time spent on manual time card entry and overtime calculations. Square Payroll also provides free time and attendance features but integrates with the time-tracking app, WhenIWork, as well. Although Square provides the best payroll app for small businesses, in our opinion, it doesn’t have as many onboarding features as you may need. If you’re in need of a more robust onboarding system that provides higher level applicant tracking, electronic offer letters, and so on, the Zenefits app may be a better solution for you. There’s also a lack of phone support for companies that are not existing customers. If you have questions prior to signing up for the service, you may have a harder time finding answers than you would with other software providers. Square phone support requires a customer code to process your call; an automated system will refer you to the website, or you can access online videos, articles, and email support for additional help. Users like the Square Payroll app’s affordability, ease of use, friendly interface, and automated features, like payroll tax filing. There are some Square Payroll reviews with complaints about customer service, primarily regarding lengthy wait times and resolution issues. Overall, it’s agreed that the net value received is well worth the cost. The Square Payroll app provides an easy and affordable way for you to manage payroll, especially if you primarily hire contractors. You can get automated payroll services for as little as $5 per month. To start running payroll from the Square Payroll app, download it today. Gusto offers a wide range of functionality, like unlimited payrolls and benefits at an affordable rate. It doesn’t have a downloadable app like our other recommendations, but you can run payroll from your mobile device using the mobile-responsive website. It also handles taxes at the local level, so you maintain compliance. Gusto is affordable for small business owners, coming in at a close second behind Square Payroll. Monthly costs start at $45 per month for one employee. Gusto provides a cost-efficient way for you to offer and provide insurance, retirement plans, and workers’ comp. In addition to the usual benefits, Gusto also provides access to 529 College Savings Plans for employees who want to start saving for their kids’ education early. Setup for the college savings plan is free, but the monthly cost is an extra $6 per employee, per month. To enroll in the 401(k) retirement plan, you have to pay a $500 setup fee, which is the same setup fee that Square Payroll charges. The difference with Gusto is you will also pay a $6 monthly fee per employee ($18 per month minimum) versus an $8 monthly fee per employee with Square Payroll. Like most great payroll apps, Gusto automates the calculation and deduction of taxes. It also automatically files and pays local, state, and federal payroll taxes. Square only pays state and federal, so if you’re located in a city or county in states like New York or Arkansas that’s subject to local income taxes, Gusto may be a viable option to help you maintain compliance. Add your state tax details, like state unemployment tax number and rate, to complete the setup for your state and local taxes, if applicable. Gusto integrates with several accounting software products, like QuickBooks Online, Xero, and FreshBooks. It also syncs to popular time tracking systems like TSheets and WhenIWork. With Gusto, you have more options to take advantage of integration versus Square, which provides integration with a single provider per service (accounting and time-tracking services). When you hire a new employee, you can use Gusto on your mobile device to check references, conduct background checks, file a new hire report in your state, and so much more. The entire onboarding process is paperless and automatic, as with many of our other recommended payroll apps, like Zenefits. Forms can be signed online, so there’s no risk of losing paperwork. Gusto offers numerous benefit options to help you make your employees feel appreciated. However, these benefits are only available in 23 states and Washington, D.C. If your business operates outside of these states, and you want a payroll provider that offers benefits you can take advantage of today, you may want to consider Square Payroll. Otherwise, Gusto will be expanding coverage to other states soon. Another key feature Gusto is missing is a downloadable mobile app. However, because it has a mobile-responsive website, you don’t need an app to use it. Depending on your needs, this could be a positive or negative. If you lack sufficient storage on your mobile device, you may enjoy this. According to Gusto reviews online, users generally prefer it for its compliance guarantee at such a low cost. Most people comment on its ease of use and user-friendly interface. There are some poor reviews about Gusto’s customer service calls taking too long, but there are tons more that were satisfied with it. Gusto makes it easy for small businesses to run payroll, pay taxes, and offer benefits on the go. And you don’t have to download an app to use on your mobile device; the website is fully functional through a browser. Try a free trial today. The QuickBooks Payroll app is an ideal payroll app for QuickBooks Online users who need unlimited payroll runs and assurance their taxes will be handled correctly . The app is free to use and integrates seamlessly with QuickBooks Online for as low as $59 per month. Historically, it could only be used within the QuickBooks Online software, but now, you can use QuickBooks Payroll without the software for as little as $39 per month. As with all of our recommended payroll apps, the QuickBooks Payroll app is free to use, but you do have to subscribe to one of QuickBooks Online’s payroll services. There are two plans: self-service starting at $39 per month and full service starting at $84 per month, and they both allow you to run payroll. 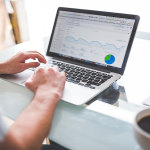 The main difference between the QuickBooks’ Online Payroll plans is that the self-service option is more of a do-it-yourself plan, and the full service plan will handle payroll for you. If you opt to combine either with a QuickBooks Online accounting package, the cost will increase. QuickBooks’ level of automation is not as strong as Square’s or Gusto’s. How much work you or your bookkeeper have to do largely depends on which payroll plan you choose. If you have your own bookkeeper, you can run payroll through the app. Automatic federal and state payroll tax calculations are a standard feature, and your bookkeeper can manually e-file your taxes through the app. 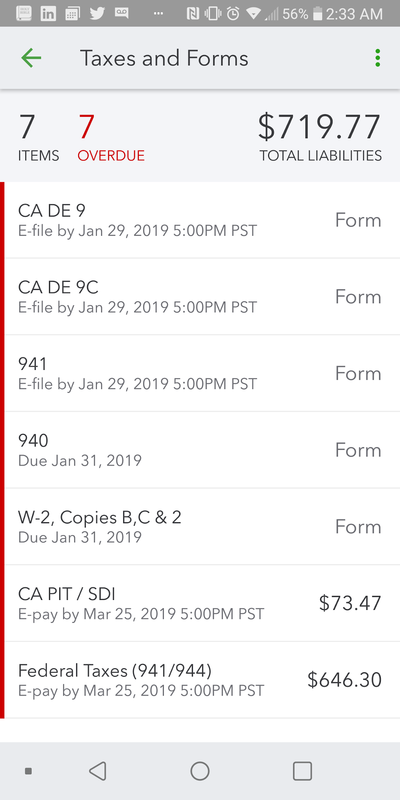 You can view your payroll tax forms and payments under “Taxes and Forms” to see what’s been submitted, what’s outstanding, and what’s past due. If you’d prefer not to have direct involvement in managing payroll and payroll taxes, you can subscribe to the Full Service plan and have a QuickBooks professional file them. Like the providers that automate tax filing, Square and Gusto, QuickBooks Payroll guarantees penalty-free filing if one of its professionals handles your taxes. If you have local taxes that need to be handled, you may want to consider Gusto or the Full Service payroll option. You can pay your employees by direct deposit or check for free. Unlike Paychex, which charges $10 to print paper checks, QuickBooks Payroll software gives you what you need to print paychecks yourself, putting you in more control of your costs. If you subscribe to the Full Service Payroll, same-day direct deposits are free as long as you are paying full-time employees. Otherwise, employees and contractors will have to wait a minimum of two days after you process payroll to receive the funds. Unlike the standard four-day processing time some of other recommended software providers impose, QuickBooks only requires you to give two days for standard processing time. Since the QuickBooks Payroll app was created to use with QuickBooks Online, we didn’t find a lot of integration options for accounting software. However, QuickBooks Online is a popular software among small business owners, so many add-on companies in the payroll space cater to it. If you need a time and attendance system, QuickBooks offers a seamless integration with OnTheClock Time Clock that you can download for free if you have two users or less. If you’re already using one of the other popular time tracking systems, like TSheets, it integrates with QuickBooks Payroll too. QuickBooks’ pricing structure and products are not always as straightforward as Square’s and Gusto’s, and customer service reflects that. You may get information from one representative today and receive conflicting information from another tomorrow. Intuit owns QuickBooks and has a multitude of products, packages, and mobile apps, and when those offerings change, there can be some confusion. Employers considering QuickBooks Payroll should be mindful of product and package names, because they can be confusing. For instance, Intuit Online Payroll used to be the only stand-alone payroll software, and QuickBooks Online Payroll was only available with a QuickBooks Online subscription. Now, QuickBooks Payroll can be used either way. If you call and ask about Intuit Online Payroll, you may get old information about the software and app, and if you don’t specify you’re referring to the cloud-based payroll system, the representative may think you’re asking about QuickBooks Desktop. Users love the affordability compared to other software providers, and many commented that it’s easy for non-technical people to use. They also appreciate that they have on-the-go access to payroll. Some had trouble during the initial setup phase and resolving issues with customer service in a timely manner. Intuit QuickBooks makes it easy to streamline QuickBooks Payroll with QuickBooks Online accounting software. You can purchase both services or start running payroll using the stand-alone payroll software. Run payroll free for 30 days. The SurePayroll app is designed for small businesses that need to run payroll without all of the bells and whistles. It allows you to run payroll on the go, change paycheck details, and track paid time off. The app is free to use for SurePayroll customers, and pricing is comparable to our best payroll apps. The SurePayroll app is free to use, and pricing for service is cheaper than other affordable providers like Gusto. Monthly prices are similar to Square Payroll’s, with the exception that SurePayroll charges higher rates for contractors. The pricing structure is flat, at $29.99 per month plus $4 per worker, per month. There are no startup costs, and the only other cost you will incur, if you don’t purchase add-on services, is a $45 fee for W-2 processing plus $4 per W-2. Integrations are considered add-ons, so you will have to pay more to take advantage. Accounting integrations are $9.99 per month, and time clock integrations are $9.99 per month. You can also pay local taxes if your business is in Ohio and Pennsylvania for $9.99 per month. SurePayroll provides far fewer features on the mobile app than some of its competitors. 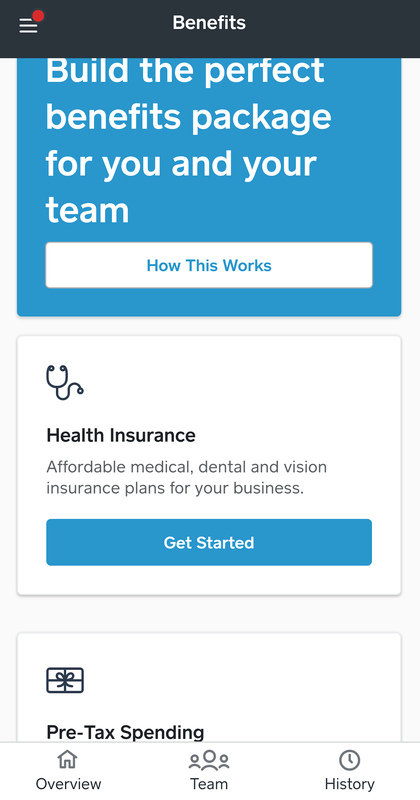 There is no benefits enrollment or management, and employers and employees use two separate apps instead of one integrated. However, basic functions for both apps are the same. 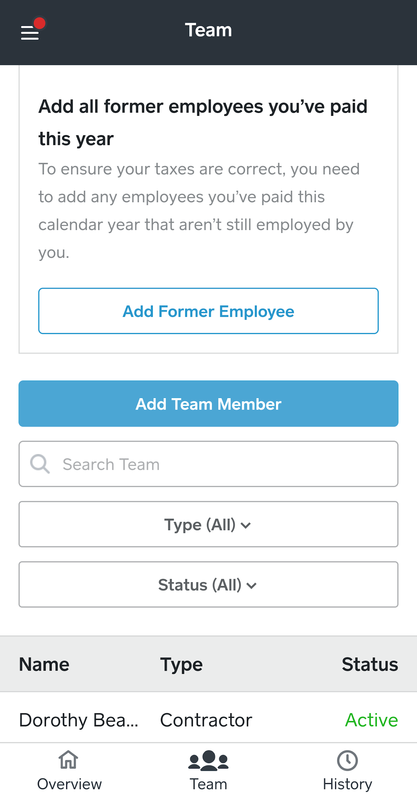 You can add a bonus and change a check date, and your employees can see their check stubs and view PTO time, similar to our other recommended payroll apps that have integrated employer and employee views, like QuickBooks Payroll. Unlike Paychex, SurePayroll doesn’t have its own time and attendance system. However, it does fully integrate with time clock partner Stratustime for an additional fee of $5 per month and $3 per employee, per month. Unlike Gusto, which seamlessly integrates with several time and attendance partners, SurePayroll only offers this guarantee for Stratustime. You can still utilize popular time and attendance systems like Homebase, Buddy Punch, and so on, but there will be an integration cost in addition to the monthly fees. Also, integrating will require an extra upload on your part. You can pay your employees through direct deposit or check for free. One of the extra complementary benefits that SurePayroll offers is a two-day payment processing period, like QuickBooks Payroll. Employees can receive their pay two days after you submit. Our second best payroll app provider, Gusto, has a four-business day payment processing window, and you can only enroll in their two-day payroll program if you submit a formal request and are approved in their qualification process. Customer support is available six days a week via phone, email, chat, or secured web forms, compared to five days of support offered by Gusto. SurePayroll also makes it easy to speak to a representative before becoming a customer, unlike Square Payroll. There are online resources like “answers to FAQs” to help you when the customer service team is unavailable. These resources are not as extensive as those that Square Payroll or QuickBooks Payroll provides, but you should be able to find answers to basic questions. SurePayroll provides basic services. Neither you nor your employees will be able to enroll in or manage benefits on the mobile app. If you offer 401(k), it will have to be managed outside of SurePayroll. There’s also no self-onboarding as there is with Square Payroll and Gusto. An administrator must set all employees up within the app or on the web. Users love the affordability and direct approach to payroll the company takes. For the customers who primarily want to run payroll from anywhere in the world, SurePayroll makes it easy. Customers who have more complex reporting needs and need HRIS features, like benefits, are not usually satisfied with the product. There are also numerous user reviews with complaints about the repeated account authentication. Users prefer that the system recognize their device so they don’t have to waste time entering a new security code every time they try to log in. SurePayroll is best for small business owners who want to pay their employees and taxes on time, regardless of where they are. Sign up for a two-month free trial to see if it’s right for you. The Paychex Flex app allows you to run payroll, manage benefits, and view reports. Because the service cost is a little pricier than some of our other options, we recommend this for growing businesses. There are multiple pricing plans to choose from that will support your company from the startup to growth and expansion stages. Paychex quoted us $86 for 15 employees per pay period. And unlike providers like Square Payroll and Gusto, they charge a $100 setup fee. Sometimes, representatives offer to waive that fee, but it’s time-sensitive. Paychex is a more expensive option, coming in at $344 ($86 quoted rate x two pay periods) per month for 15 employees versus $104 per month with Square ($29 plus $4 per employee, per month). Paychex’s price can fluctuate depending on the features included. Though Paychex is more expensive, it comes with added features, which make it a more valuable choice than SurePayroll. The Paychex Flex app allows you to run payroll, set up direct deposit for employees, change pay rates, and run numerous reports from your mobile device. Your employees are able to log in through the same app and view their checks stubs and time off balances, set up direct deposit, and enroll in benefits. Paychex offers benefits through its own providers and can give you access to provide them to your employees. Once you decide which package you want to establish, you can store an electronic PDF of your benefits guide within the app for employees to review before enrolling. The app tells them when they are eligible to enroll and gives them the option to do so immediately or wait until a later time. Like Gusto and Square Payroll, self-onboarding is a key feature of the Paychex Flex mobile app. Once you enter basic information about your new employee, you can turn on the Paychex Flex Account Invite feature. It will email your new hire so they can create their own account to see pay stubs, time off, and set up benefits. Instead of integrating with an outside partner, Paychex has its own time card system, Paychex Flex Time, that you can access via the Paychex Time Kiosk app. It seamlessly integrates with the payroll app, and there are different solutions, depending on how many employees you have. It costs extra and isn’t included in the amount we were quoted above, but it makes it easy for hourly employees to clock in and out, perform job transfers, and much more. You can view a range of reports within the Paychex Flex app. Of course, you can see payroll and quarterly tax filing reports similar to those that are available in Square Payroll and Gusto’s mobile apps. But you can also see payroll cash requirements, department summaries, and your payroll journal. The Paychex Flex app gives you access to much greater detail than the other providers on our list. You can even view your payroll labor costs as a live report. While Paychex offers a wide range of reports, they are not easily customizable. You can request that the company build a report for you, but it can be time consuming. It’s also missing a truly affordable option for small businesses. It charges for each payroll instead of monthly, like Square Payroll and Gusto. Paychex Flex user reviews are mixed. Customers like that Paychex’s online system is easy to use and they stay updated on the new tax tables and labor laws. Running payroll seems to be fairly simple, but attempts at customizing features within the Paychex system has caused problems for some users. Many users also complained about the high personnel turnover and the negative effect it has on the customer service quality they receive. 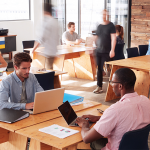 Paychex is ideal for medium to large companies interested in having a complete HR platform that’s accessible on a desktop and via mobile device. Request a free demo today. The Zenefits app is a mobile extension of the Zenefits HRIS platform. Because it’s specialized, it’s more expensive than the providers we rated at the top of our best payroll app list. If you’re planning to expand to 50 employees anytime soon, HR compliance will become more important, and Zenefits could be a good fit. Zenefits provides HRIS features in both its basic and advanced plans, and payroll is included as an add-on. You can manage your documents, reporting, and onboarding process with both, but the advanced plan gives you more compliance and time tracking features. You can pay as little as $45 per month for the Standard plan or $49 per month for the Advanced plan if you have one employee and opt for an annual contract instead of monthly. Similar to Square Payroll, rated our best payroll app, employees can self-onboard online. With the Zenefits app, however, the onboarding process is much more in-depth. All new hire data automatically syncs with the Zenefits platform and reflects within the app, so you can customize and view offer letters, handbooks, and even performance reviews. Time tracking is available as an add-on through Zenefits’ time and attendance app. It uses geolocation to register employee locations at the time of clock-in to prevent buddy punching or off-site clock-ins. It also integrates well with all of Zenefits’ other apps, pushing hours worked directly to the payroll app. PTO hours and employment status are shared back to the Time and Attendance app. Zenefits features a knowledge base, the HR library, you can explore for answers to a variety of questions, including federal and state law, hiring, leave, and much more. Responses are immediate and specific to the state you’re interested in. This is a great feature for businesses in highly regulated industries, especially if HR law changes regularly. While the Zenefits app provides access to an awesome HRIS system, it lacks the capability to run the full payroll cycle. You can view and approve employee time cards, but you cannot finalize payroll within the app. To finalize and initiate the payment process, you must use the browser. Many Zenefits’ user reviews gave positive feedback regarding the comprehensive HR solution that they can access in one app. They appreciate that all of the processes are streamlined, and the system is easy to use. Although Zenefits costs more than some general payroll providers, overall, most users agree that the platform has made HR management much easier and less expensive. There are some complaints about reporting not being flexible enough to meet their needs and average-to-poor customer service. Zenefits helps businesses that don’t yet have a human resource (HR) professional on staff stay in compliance with HR laws. The system joins HR and Payroll under one system and app. You can download the Zenefits app from your Play Store to see how onboarding, benefits, and performance reviews work in the demo. Get started with Zenefits today. Using mobile apps to manage payroll out of the office is a necessity for many business owners. Good payroll apps help employers pay employees accurately and on time, as well as avoid tax-filing penalties. The best payroll apps for your business depend on the type of workers you hire, employees versus contractors, and compliance needs. Our recommendation for the best payroll app is Square Payroll. It offers the cheapest rates, is easy to use, doesn’t leave out basic features (like tax payments and filings), and still provides access to advanced features like benefits. Visit the website for details.